Born in France in 1961, Sophie the Giraffe quickly became a "must have" in baby’s essentials. Sophie the Giraffe is designed to stimulate the senses and soothe the teething gums, Mothers recognize right away the benefits of this little giraffe for their child. Sophie the Giraffe has wowed over 10 million babies (and parents!) with her natural beauty and charm. 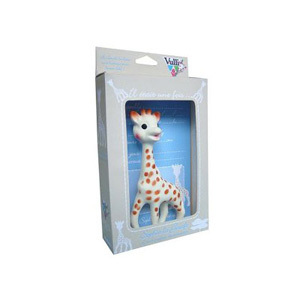 Sophie Giraffe is handmade with all natural flexible rubber and non-toxic paint. No chemicals softener; parabens, PVC, phtalates, BPA (bisphenol-A) and nitrosamines in Sophie. She is a safe alternative to plastic teether and complies with the U.S safety requirements of ASTM F-963. Sophie Giraffe is soft, flexible, and slender, making her easy for babies to grasp and squeeze. Makes a happy squeak sound when squeezed. Great alternative to a plastic teether. Makes a perfect baby gift for Newborn to 12 months.